Randall Kennedy of Harvard Law School addresses University of Houston Law Center faculty and students during a discussion in the Hendricks Heritage Room. 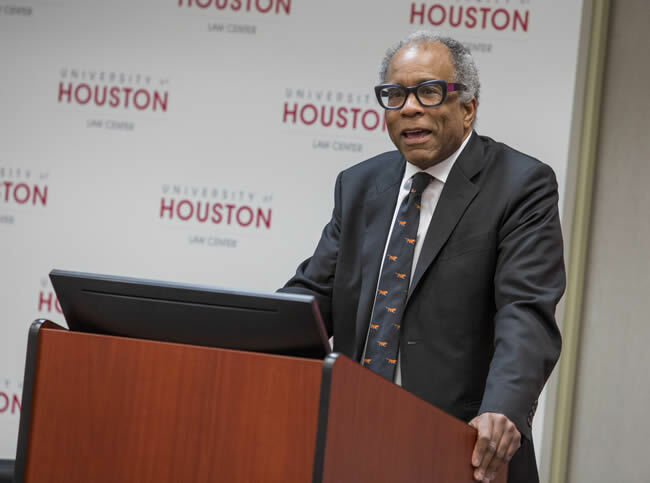 March 12, 2018 - An expert on race relations considered some of the victories and defeats of the Civil Rights Movement as part of the 2018 Distinguished Speaker Series last week at the University of Houston Law Center. Randall Kennedy, the Michael R. Klein Professor of Law at Harvard Law School, based his talk on his draft paper, "Walker v. City of Birmingham revisited." Walker v. City of Birmingham was a 1967 case that centered on civil rights protesters who planned to demonstrate on Good Friday and Easter, but were denied the necessary paperwork from Birmingham city officials. In response, the activists said they would proceed with their march. Birmingham then obtained a temporary injunction from a state court to prohibit the protest. Martin Luther King, Jr. was one of several marchers who ignored the order and was arrested. In a 5-4 decision, the Supreme Court determined that individuals cannot defy an injunction even if the injunction is seemingly unconstitutional, upholding King's sentence. "The overwhelming thing about this case is the Supreme Court of the United States extolling a civilizing end of the law in a judgment that consigns to jail of all people Martin Luther King, Jr.," Kennedy said. "It's a remarkable ending to the case and in my view it's a case that does not bring honor to the Supreme Court of the United States." The next speaker in the series will be Joseph Fishman of Vanderbilt Law School on March 19.